Providing emergency services on the coldest, driest, windiest continent on earth has forced the Antarctic Fire Department to develop and implement innovative, effective tools and tactics for Antarctic fireground operations. The environment proves challenging, but the AFD continues to provide the services necessary to keep McMurdo and Amundsen-Scott Stations safe from the threat of fire. Target hazards for the AFD include nearly every structure. All buildings are considered critical to USAP operations and the loss of a single structure could effectively shut down a significant portion of station operations, if not the entire station altogether. Major target hazards within McMurdo Station alone include the Crary Scientific Laboratory, the heart of McMurdo Station's operational purpose, as well as the Heavy Shop (vehicle maintenance facility); power plant; water treatment facility; water de-salination facility; multiple fossil-fuel storage tanks; airfields and aircraft; various storage facilities; station dormitories; and misc. HazMat around the station. At Amundsen-Scott South Pole Station, every square inch is vital to station operations. Damage from fire could have catatrophic consequences for station operations. 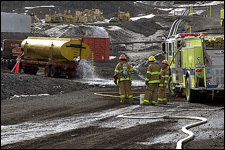 Similar to Mcmurdo, hazards also include the scientific laboratories, various hazmat, power plants, and airfields. 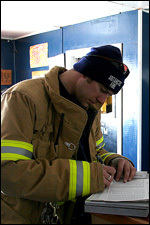 Because prevention is the first step in fire control, the AFD assigns an officer to oversee fire prevention practices, compliance, and education on McMurdo Station & Amundsen-Scott South Pole Station. All USAP personnel are required to undergo training in fire prevention practices and also the use of basic fire suppression tools (such as extinguishers). The prevention officer ensures that each USAP structure is thoroughly inspected at least once a month by on-duty crews and that any issues discovered are corrected in a timely fashion. AFD's prevention division also inspects, maintains, and re-charges/services all fire extinguishers for the USAP. Training never ends in the fire service, and there is no place where that holds more true than the harsh reality that is Antarctica. The AFD must be prepared to quickly deploy and mitigate ANY emergency that may arise. The AFD continually trains so that personnel are familiar with all areas and idiosyncrasies of McMurdo Station and Amundsen-Scott South Pole Station, locations of both hazards and resources, and equipment and tactics necessary to complete their mission. In addition to their previous fire service experience and training, all AFD personnel are sent through a rapid, intensive ARFF (Airport Crash/Rescue FireFighter) academy at a state-of-the-art aircraft training and fire simulation center in the United States. Once deployed to Antarctica, AFD personnel continue to train each shift between crews and other station personnel, practicing and perfecting rapid response tactics and techniques. The AFD is held to strict response requirements, which include arriving on-scene of any incident reported within two minutes of dispatch. This also includes incidents at all USAP airfields. All United States Antarctic Program buildings are outfitted with state-of-the-art fire detection and alerting systems, which report directly to the emergency communications centers, located in the respective hearts of McMurdo and Amundsen-Scott Stations. 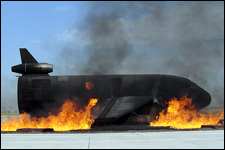 For the US military airfields, the AFD provides "hard-stand" (AFD fire crews stand-by in ARFF apparatus on taxi-ways) for the departure and arrival of all USAF aircraft. While emphasis is placed on planning and prevention, emergencies do occur. When they do, fast and effective incident mitigation is essential, so that impact to station operations is kept to a minimum. Responding quickly, e AFD assesses the situation and utilizes the training and resources available to them to prevent further incidentrogression, and to mitigate any damage. For working fireground operations, the AFD utilizes a combination of traditional and extreme weather tactics for fire suppresion. Class	1 engines and the water tender unit run simple water, with the Class 1 engines having the ability to convert to foam operations within moments. McMurdo Station has an intricate water supply system that supplies the entire station with potable water through insulated piping above-ground. Throughout this system are strategically placed "hydrant" hook-ups that the AFD utilizes in the event of a fire. Structures are also sprinklered and have stand-pipe connections for interior fire operations. 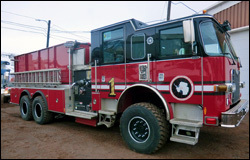 ARFF apparatus are equipped with either water, compressed air foam, Purple K dry chemical fire retardent, or a combination thereof. The multiple suppression methods ensure any aircraft incident can be effectively mitigated. Just like at home, Antarctica residents dial 9-1-1 for medical emergencies, and the AFD responds. 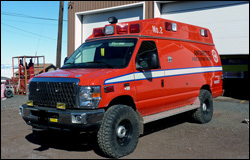 At McMurdo Station, the AFD operates two rescue ambulances and has Firefighter/Paramedics assigned to each	station on each shift. In the event of an emergency, the AFD responds, assesses the patient, transports the patient to McMurdo General Hospital, the station's medical center. 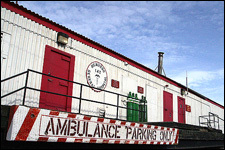 McMurdo General Hospital is equipped as a small, but effective Emergency Department capable of treating most medical conditions and some emergency surgical procedures, if necessary. If more definitive treatment is required, the AFD assists McMurdo Station's medical staff with ambulance transfer to one of the USAF airfields, where an awaiting aircraft transports the patient to Christchurch, New Zealand.